Sepp Blatter is open to hearing Qatar's explanations after accusations of abuse of workers. FIFA PRESIDENT SEPP BLATTER confirmed on Friday that he would favour playing the controversial 2022 Qatar World Cup in November and December. “We are starting the consultations to bring it to the winter time. It can only be done in November-December, not January-February,” Blatter told reporters in Abu Dhabi, where he will attend this weekend’s under-17 World Cup final between Nigeria and Mexico. The head of world football also said he would also be prepared to listen to Qatar’s response to accusations of abuse of workers. Qatar has come under fire over the treatment of migrant workers who are employed to build the massive infrastructure needed for the tournament. 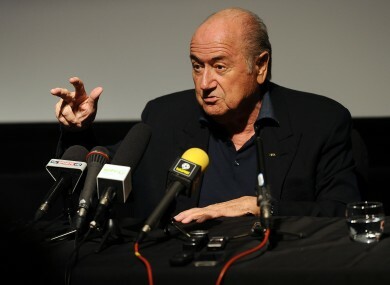 “A clock has a ding-dong”, Blatter said. The prospect of moving the 2022 World Cup from its traditional June and July slot to January-February has angered winter sports federations because of a possible clash with that year’s Winter Olympics. Winter sports federations and broadcasters argue that a high-profile football event clashing with their own seasons would dent television audiences and revenues. But putting the staging of the World Cup back to the end of the year would appease them, while also meaning that the tournament would interfere with the 2022-23 football season rather than 2021-22. The world of football is already split, with critics saying the climate issue could hardly have escaped FIFA’s notice when Qatar initially bid for the hosting of the tournament. However, England’s Premier League has led the opposition to moving the start date of the tournament. “Our main concern is to consult with the stakeholders, and all participants in football clubs, leagues, national federations and players,” said Blatter. “Another category is the economic partners, marketing, media and televisions. It is a change in the international calendar that affects specially television,” he added. Email “Ding dong Blatter open to hearing Qatar's side in worker abuse claims”. Feedback on “Ding dong Blatter open to hearing Qatar's side in worker abuse claims”.